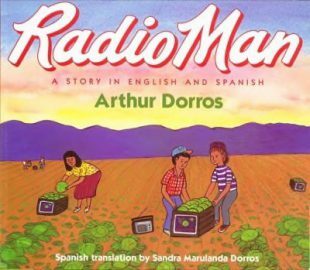 Radio Man/Don Radio, Arthur Dorros. NY: HarperCollins, 1993. Discuss the history of the Dust Bowl and the migrants of that time period. Share a book with Dorothea Lange’s photographs of migrant workers. Discuss the differences of the situations. Discuss Cesar Chavez and his organization of migrant workers in the 1960’s. Read Working Cotton and Radio Man. Compare the experiences of two different migrant children. Discuss the migrant workers who work in many states, and our own area, harvesting and working with numerous fruit and vegetable crops. Research the crops that are grown in our region. Write a story about a time when you moved or traveled with your family. Write a radio show. Tape record it and use sound effects. Look at the grammar marks in English and Spanish. Discuss the differences (upside down exclamation points, no quotation marks, etc.). Voices from the Fields, S. Beth Atkin, 1993. Boston: Little, Brown. The Upside Down Boy/El Niño de Cabeza, Juan F. Herrera, San Francisco, Children’s Book Press, 2000. Children of the Dust Bowl, Jerry Stanley. NY: Crown, 1992. Working Cotton, Sherley Williams, San Diego: HBJ, 1992. A Migrant Family, Brimner, Larry. Minneapolis: Lerner Pub., 1992. Vejigante Masquerader, Lulu Delacre. NY, Scholastic, 1993. Margaret and Margarita, Margarita y Margaret, Lynn Reiser. NY: Greenwillow Press, 1993.